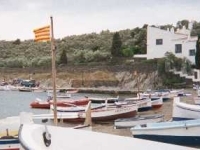 The busy fishing village of Cadaques draws plenty of visitors, but they do not come for the local beach, which is rather narrow and stony. Rather the resort town's attractions are its picturesque natural harbour, some excellent restaurants, numerous galleries, fashion and art and craft shops, and the former home-turned-museum of world-renowned surrealist painter, Salvador Dali, situated in Portlligat Bay, just to the north of the town. Dali's somewhat bizarre home consists of a labyrinthine cluster of fishermen's huts, added to the original building in various stages by the artist over a period of 40 years. Visitors must reserve a time for entry in advance as only about eight people are allowed in the museum at a time. You can book via the website, by phone or by email and must arrive at the museum to collect your tickets at least half an hour before your appointed entry time. Touching any of the art is strictly forbidden. Despite how strict this all sounds, the staff are very friendly and the limited admission makes the experience more intimate and rewarding. Tours are not guided and the house is remarkable, as one would expect from Dali. The house is very prettily located and there are lovely sea views from some of the windows. Transport: Train to Llanca or Figueres station. It is possible to walk to Portlligat from Llanca station, or to take the bus from Figueres. Opening times: Open daily but opening times vary according to season and day. Entry to the museum must be reserved in advance as numbers inside are limited. Admission: €11 (general); €8 (reduced); children under 9 free.